The DII baseball season is finally here. With the first pitch of the 2019 season on Feb. 1, the road to Cary, North Carolina will officially begin. There is a boatload of talent returning for Mercyhurst that makes them the team to beat here. Righties Tyler Garbee and Russell Lamovec highlight a rotation full of some of the PSACs best-returning pitching while catching transfer Dom DeRenzo brings some pop and excellent defensive skills to the lineup. Last year, NCAA.com called Seton Hill a sleeper in this conference, but now they are true contenders. Returners Pat Monteverde and Kenny Wells are joined by transfer Cole Masik on the bump, and the return of a healthy Craig Lewis in the lineup makes this team interesting to watch. Millersville head coach Jon Shehan always seems to have a crop of big-league talent, and with Eli Nabholz and Cordell Shannon returning to the rotation and a handful of offensive returners, the Marauders should make some noise. Ace Jacob Blank, who pitched a gem in the championship game last season, is now in the Minnesota Twins organization, but the Vikings return plenty in the lineup that played some of the most exciting small ball in DII last season. Mason Janvrin, who led the MIAA in stolen bases, returns to the lineup for the No. 2-seeded Central Missouri Mules and Luke Mercer is back to anchor the bullpen. Minnesota State always seems to find a way to be in the hunt, and with a bevy of returners, expect the same in 2019. There is certainly going to be a changing of the guard in the East. Le Moyne has to move forward after losing DII baseball’s most-prized pitching prospect in Josiah Gray to the draft, while the Gio Dingcong and Joseph Pena era comes to an end at St. Thomas Aquinas. Both will contend, but so can New Haven and Franklin Pierce. That has to give the upper hand to the returning East champs. The Penmen return veteran arms Jake Walkinshaw and Wesley Tobin, while stud third baseman Tom Blandini returns to power the lineup. Southern Indiana swept its way through the Midwest region as one of the surprises to reach Cary. Its top hitters are gone as is some of the top pitching, but as defending champs the Screaming Eagles deserve a mention. Bellarmine, with a bevy of arms to watch like Brandon Pfaadt, Eddie Mathis, and Shane Barringer just to name a few, may be the team to beat, but Quincy looks sharp as well. Cody Birdsong leads an experienced lineup that also returns Nolan Snyder, who missed most of 2018 after impressing in the 2017 championship in Grand Prairie, Texas. UIS loses a ton of power from its lineup, but the bulk of the pitching staff returns. The Prairie Stars may win a little differently in 2019, but they should win. The South Regional tournament is usually just as exciting as the final games in Cary. 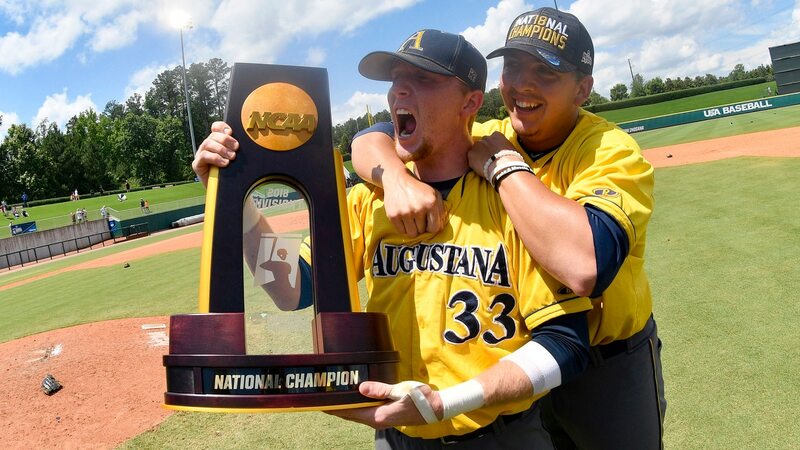 It’s top heavy in some of the best talent DII baseball has to offer. Last season it was the Mocs who reigned supreme, but once again, this region is stacked. Tampa may be the best in the land, with first baseman Keenan Bell powering the lineup and Keven Pimentel, Jacinto Arredondo, and Bo Weiss just a few of the talented arms Sam Militello gets to work with this season. The Mocs should be just fine as well. They lost some big names, like exciting two-way star Logan Browning and JT Hintzen, but righty Cooper Bradford may be one of the best in the land and Jacob Teter is a familiar big bat in the lineup. Delta State and Nova Southeastern lost quite a bit but seem to have the pieces to quickly reload. Mississippi College may be the best team in the country no one knows about, and Saint Leo may be ready to turn some heads this season. Grab the popcorn, this region is going to be a blast. The Javelinas were an awesome story last season and return a bulk of the pieces that got them there including big-hitting Manny Laredo and southpaw Tyler Flores who excelled as a freshman on the bump. Senior righty Joe Corbett leads an intriguing pitching staff for West Texas A&M that could very well have the Buffs back in the hunt. Colorado Mesa will be powered by several of DII baseball’s most exciting freshmen, as Nathan Wilson and Andrew Morris are already young pitchers all eyes should be on. Mikey Gangwish will power the Mines offense, but how their pitching performs will be the key as to how far it goes. The Cougars won’t have any problem on offense as top hitters Robert Brooks and Austin Pharr highlight a group of experienced bats that led to the 2018 national runner-up finish. The good news is that ace Kolton Ingram returns, but the bad news is they lose a lot of depth from last year on the mound. Learn the names Mitchell Spence, Zach Rafuse, and Hunter Shuff as they are three big-time arms that could help USC Aiken — who are playing with a big chip on its shoulder after barely missing the tournament last season — to the top of the region. Garrett Green, Cal Gentry, and Wesley Wommack make Georgia College one of the scariest offenses in the region. Like the South, this region is stacked, and while the Cougars are the early season favorite as reigning champs, they better watch out for North Greenville who may just be the best team in DII baseball when it’s all said and done. Michael Neustifter leads what could be one of the most potent offenses in the land. The reigning, two-time West region champs are the favorites until someone else can prove otherwise. It won’t be any easier for the West in 2019 as the Tritons, as they seemingly always have under the Eric Newman era, have reloaded with plenty in the tank for another run to Cary. Alex Eliopulos has been as steady as they come the past two seasons and returns to power the offense, while Ted Stuka and Jonah Dipoto provide two exciting righties on the mound to combine with the veteran southpaw Preston Mott. Azusa Pacific looks like it can build off of last season’s 41-win campaign and we’ll find out right away. The Cougars face off against the back-to-back CCAA champion Otters on opening weekend.